Studies show that extended learning time is positively linked with improved student achievement. Studies also show that students lose 2-3 months of learning during the summer months. A school in New Hanover County found that before leaving for summer break in June 2014, 49% of K-5 students were proficient in math and 64% were proficient in reading. When those students returned to school in September, proficiency levels had dropped to 9% in Math and 42% in reading. 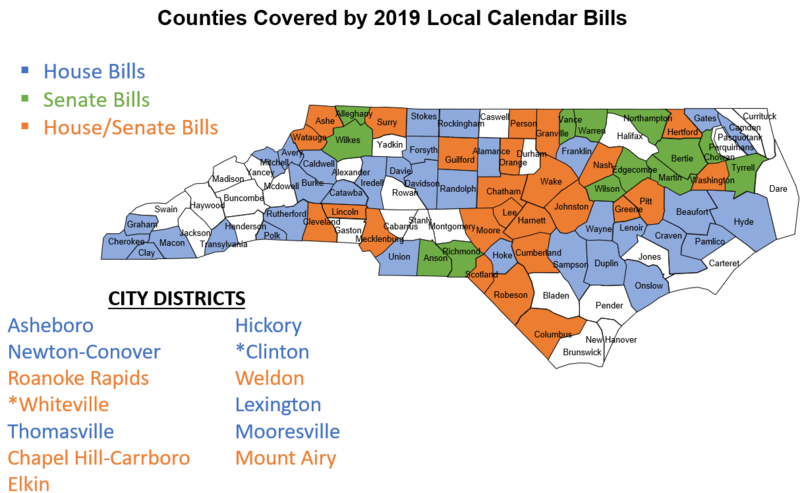 This 2017 report from the Program Evaluation Division of the NC General Assembly examines the effects of the current school calendar state law. How is the Current School Calendar Law Impacting NC's Students and Schools? First semester exams, including End-of-Course exams, are now administered after winter break because the school year must start so late. Second semester for K-12 public schools begins approximately two weeks after second semester begins for community colleges, creating a drastic misalignment. School districts that qualify for inclement weather exemptions from the mandated calendar dates can only start school five days earlier in the school year, even though eight closed days is the threshold for qualifying for the waiver. Local school districts and educators are bearing unnecessary burdens that distract from their core mission of educating children. Calendars around the state are not designed to fit the distinct needs, geography, and characteristics of local communities. School districts have little incentive to take innovative approaches to calendar design. It is more difficult for districts to craft calendars that could lessen summer learning loss.